There were a lot of spare greens kicking around the fridge today when I got home from work. There was kale, red leaf lettuce, and the fresh watercress I'd just purchased. I decided that this was their last stand. It was time to clean out these old greens and bring in a new batch for the weekend. The recent truce between me and kale has been going well. I've found a number of ways of preparing it now that don't make me sad so this is a huge triumph. It's taken us more than thirty years to achieve this delicate balance. I'm hoping it remains undisturbed. 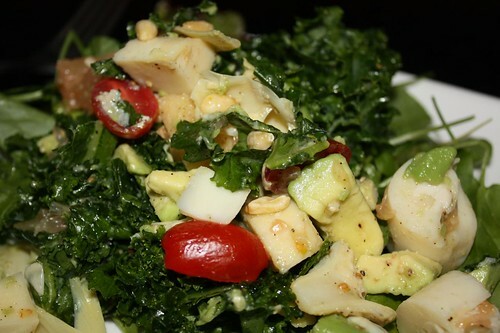 I tossed the kale with some lemon, pine nuts, hearts of palm, artichoke hearts, grape tomato, cayenne, and just a drizzle of olive oil. I felt this was sufficient. Actually I though this was probably too much but it was going to utilize some ingredients we'd had for a while. Jen pushed the envelope by telling me to add avocado and grapefruit. There were a lot of flavors going on in this salad but it seemed to work. Not as delicious as the lime and kale salad from the other night but still pretty good. It's not often you find fresh cockles that are quite as wondrous as the ones I came across today. I took them home, put them in salted water (one tablespoon of salt in about one quart of water), and watched them all spit out and excess sand. I even put in one of those little robotic divers standing next to a sunken treasure chest to recreate what they were used to. 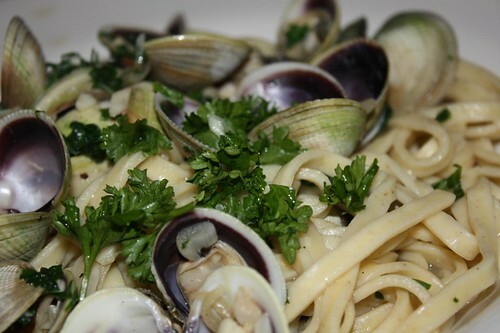 I put some olive oil and butter in a pan, cooked up some garlic and shallots, tossed in the cockles with a little white wine until they opened then threw in a handful of chopped parsley and tossed in some fresh linguine that I'd just cooked. It's hard to get any better than that for a pasta dish. Yesterday I purchased this giant 50 flavor Jelly Belly sample pack for Jen so for dessert we enjoyed some of the recipes they included in the box. This one was for a banana split. If you close your eyes you can almost taste the banana split. 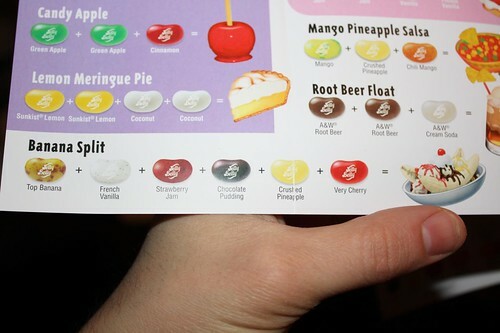 At least I think that's a banana split. 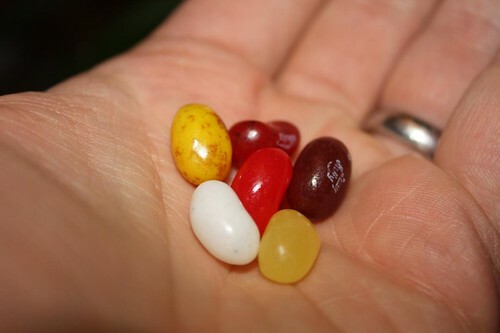 It might just taste like a handful of assorted jelly beans. I'm so glad Jen got a 50-flavor pack! Now I can enjoy mine guilt-free.